When i view the results a noticed that a evident call from the UG was missing in the mutect output. After i saw the bamOut from mutect, I release why... after the realignment all reads from the position were removed. From the coverage track it looks like few reads if any are being counted as informative at the start of your region of interest. 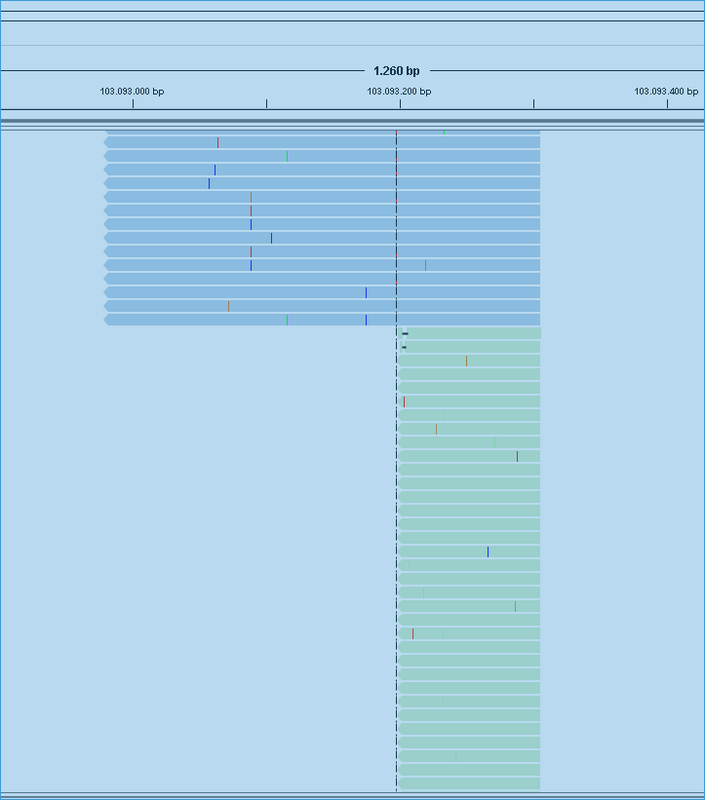 But it's hard to say anything more than that because your bamout screenshot seems to be only showing the candidate haplotypes, not the actual reads. You can use the "color by sample" to distinguish them in IGV. Overall the region looks very messy so you would probably not get confident somatic calls from this. I'm sorry, is this a question or just an observation? This is expected behavior, as documented for HaplotypeCaller. Realignment within the caller allows elucidation of such regions where the mapper makes mistakes. A mashup of both I was digging a little bit deeper into the HC-Doc..i assume the bottom of the picture "shows" the active region for my sample. Is the determination of the active region influenced by the number of Reads ? So that regions with higher read counts had a better chance to get marked as active region ? Ah, got it. No, the active region triggering does not rely directly on the number of reads present; it's more a question of the proportion of reads showing non-reference bases. We don't want to be biased against low-coverage regions. Ah, got it. No, the active region triggering does not rely directly on the number of reads present; it's more a question of the proportion of reads showing non-reference bases. Ok, do I interpret correctly that the start of my reads are to "blurry" to be recognized as active region. Ty for the quick response...i used the "color by sample" option in IGV. I attach a screenshot showing the actual reads from the bamout. Can you anything more to it ?